Walkie-talkies and two-way radios are used in a variety of scenarios, from summer camp staff to transportation. They can be an important part of your job, requiring you to relay messages to people outside your office space or location. Learning to communicate with proper lingo can be important, but more important is learning to communicate efficiently and effectively without stepping on anyone’s toes. This article will address walkie-talkie radio etiquette. There are a few simple rules that you should follow once you turn on your two-way radio or walkie-talkie. Following these will ensure that you will hear when someone calls you and be able to convey your messages out to recipients on the other end. Check that the power is on and the volume is at a high enough level you can hear the transmissions. Check that the battery has been charged sufficiently. Wait until the line is clear, then do a radio check. Do a radio check frequently to ensure that the radio or walkie-talkie is still on and both accepting and receiving messages. You should never say the first thing that comes to mind when speaking on a walkie-talkie or two-way radio. Unless you have a great deal of experience with these devices, your first message is likely to be too long and may not include the proper call sign or lingo. Follow these rules to make certain your message does not fail to be understood. Memorize the call signs and location of people you regularly communicate with. Think about your message and to whom you are sending it. Do not interrupt a conversation in progress, but wait for the line to be cleared. Make your message with precision, conciseness, brevity, and clearness. Avoid long and complicated transmissions. If your message is long, break it up into several transmissions. Do not use any abbreviations or codes not well-understood by the group. The international language of transmission is English. Do not speak another language unless you are licensed to do so. Here are a few more guidelines that don’t fit in the abovementioned categories, but are just as important. Be sure to follow them to maintain a proper walkie-talkie etiquette. Do not answer a transmission that does not include your call sign. If you are unsure if your call sign was said, wait and listen for it to be said again. Do not relay any confidential information, even if requested, unless you are sure the connection is secured. Just because it is an emergency, that does not give you the right to ignore etiquette. If someone else is in the middle of a conversation, these steps will tell you how to relay your urgent message. Wait until you hear “over”. Press the push-to-talk button and say “Break, break, break. [your call sign]. I have an emergency message for [recipient’s call sign]. 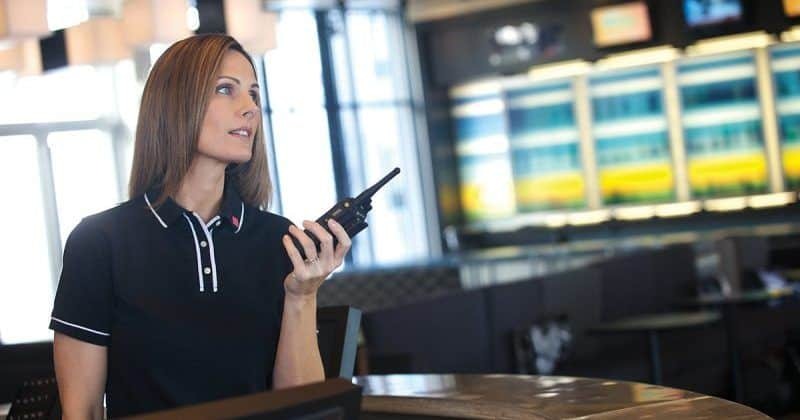 While there is much more to learn about using a two-way radio or walkie-talkie properly, these guidelines have given you the basic etiquette of using your device. Hopefully, now you can use a walkie-talkie or two-way radio without stepping on any toes or making yourself look like a fool.